Great shirts and great company!! Pilot has been great helping me design shirts for my shop!! If you want to look good, this is who you need to go with!! All shirts are custom made, you choose your colors, logos and placement. No per-logo fee, all logos and designs are included in the base price. Shirt length allows for wearing the shirt both tucked/un-tucked. 1/4 zip allow for full frontal logo placement without interruption by zipper line. Micro Fiber Birdseye Flatback Mesh fabric is moisture wicking and breathable. all crew shirts constructed of sublimated Micro Fiber Birdseye Flatback Mesh. Sublimation allows for any logo/design to be added to your crew shirts without increasing cost. Both Standard Weight (4.5oz) and Heavy Weight (5oz) fabric is available. 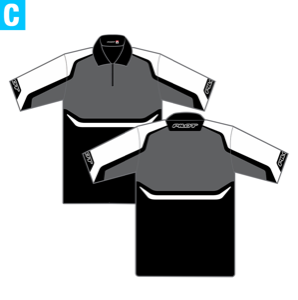 A “hidden” lay flat left chest pocket can be added for anadditional $5 per shirt.